Some of literature’s most outstanding works have been penned by exiled writers. Ostracized in their own societies and deemed by their native countries’ ruling elites as being too honest, hence too dangerous, exiled writers – whether self-exiled or banished outright – seem to share a heightened awareness of life’s larger patterns and possibilities, in part because persecution has made them stronger, more alert, and as ever dedicated to human rights and freedom of expression. 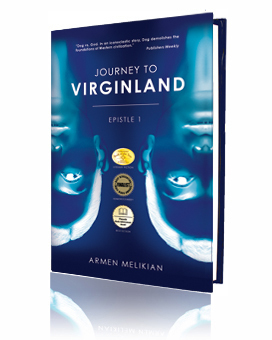 With the publication in 2012 of his novel Journey to Virginland, Armen Melikian quickly joined the ranks of celebrated exiled writers who lambaste their homelands’ oppressive regimes while simultaneously embodying a collective conscience, a certain crystallization of wisdom, which strives to give expression to the suppressed potentiality of a people. In Armenia, Melikian was made into a persona non grata for writings that denounced provincial mores, social inequity, xenophobia, ultranationalism, religious tyranny, and government corruption. In no uncertain terms exiled from the homeland of his ancestors where he had gone to live for a while (E.U. Politics states: "Melikian lived in Armenia for three years and was exiled due to his devilishly iconoclastic writings. "), Melikian went on to write a dazzlingly multilayered novel that, like the writings of Alexander Solzhenitsyn and Milan Kundera, transcends a specific locus to become a work of genuinely universal relevance. The novel has earned praise from leading U.S. publishing-industry sources. "Dog vs. God. In an iconoclastic story, Dog demolishes the foundations of Western civilization," writes Publishers Weekly. ForeWord Reviews says: "An engrossing, brilliantly crafted read. Melikian's prodigious writing talent and ability to show the world's history in a different, sometimes humorous, sometimes tragic air, creates an entertaining ride into warring religions, warring cultures, warring sexes, and the histories and raison d'etre behind each. Melikian is an astonishing writer who teaches his reader about the world through tragedy and humor." Midwest Book Review dwells on the relevance of the novel to post-9/11 America: "The world seems like a giant storm of everything wrong with the world and not a whole lot right. Journey to Virginland follows young Dog as he embarks on a journey through America and the chaos of the post 9/11 world where he looks for what it means to be human and the constant changes one must undergo to maintain a connection to one's sanity through it all. With plenty to ponder and plenty to entertain, Journey to Virginland is a fun and enlightening read and is quite the recommendation." As he weaves a lush tapestry of ideas interlaced with the story of Dog, his novel’s picaresque antihero, Melikian brings a new, powerful voice to the legacy of exiled writers. Today, while these writers remain glaring reminders of the ravages of intolerance, masterworks such as this novel are a testament to the tenacity of the human spirit and the boldness to imagine a better world. Looking for a masterpiece by one of the best living exiled writers? Get your copy of Journey to Virginland today!